Upon re-examination of large telomere datasets from healthy human populations, a downward secular trend in telomere length at birth was found. The authors theorized that relatively recent environmental stresses to female germ cells could have driven the observed intergenerational telomere erosion; otherwise, these trends would have pushed populations into pathological telomere length ranges within a few centuries. Strangely, the authors decided to disregard an 11-year-old theory of telomere-driven macroevolution that is based on progressive intergenerational telomere loss as the driving force behind species extinction and speciation. 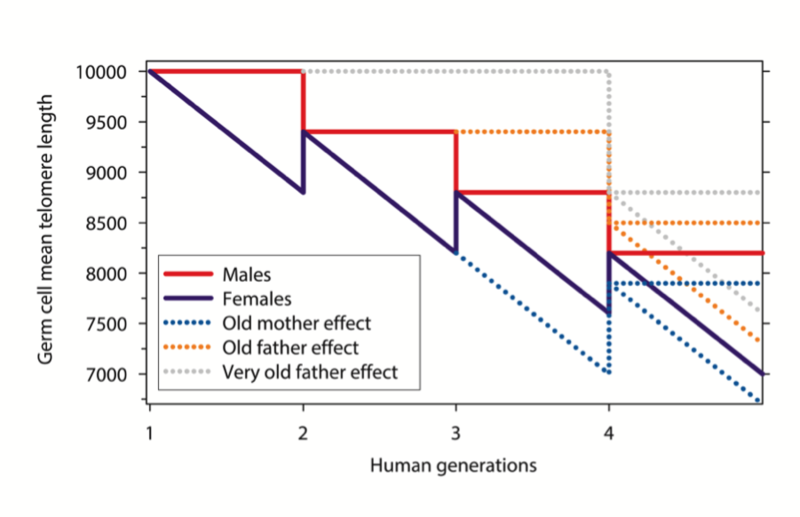 Additionally, Holohan and colleagues introduced a “new” interpretation of the old-father-long-telomered-offspring effect, namely as a consequence of intergenerational telomere erosion in the female lineage. Yet, an identical theoretical model has been published twice, several years before. To distinguish between a temporary trend caused by environmental pollution and a general evolutionary mechanism of intergenerational telomere erosion, we urgently need telomere length data from multigenerational studies on mammals with a short generation-time. In Aging Cell, Holohan and colleagues recently presented a reanalysis of telomere data from three large studies and revealed a downward secular trend in telomere length at birth in healthy human populations (Holohan et al. 2015). The authors speculated that environmental stresses to female germ cells may drive the observed telomere erosion. Yet, it was concluded that the phenomenon of intergenerational telomere erosion must be relatively new (occurring in the 1900s); otherwise, these trends would have pushed populations into potentially pathological telomere length ranges within a few centuries (Holohan et al. 2015). Paradoxically, the authors did not discuss the 11-year-old theory of telomere-driven macroevolution that is based on a progressive intergenerational telomere loss as the driving force behind species extinction and speciation (Stindl 2004, 2014). The model has been published in two respectable peer-reviewed journals and has been widely covered by the press (Ravilious 2004a, 2004b). I therefore assume that the missing citation is just a consequence of time and space restrictions and not of ignorance. Yet, over the years, I have contacted numerous colleagues in the telomere field, described the telomere-based evolutionary theory in detail and asked for a re-evaluation of data to search for any evidence of intergenerational telomere erosion. However, my colleagues either disagreed (e.g., one of the senior authors of the Holohan et al. paper), responded with “if I have time, I will take a look at your paper” or did not respond at all. Because my model of intergenerational telomere erosion in healthy human populations (Stindl 2004, 2014) has not been widely accepted in the scientific community for more than a decade, I am very excited now to see a change in this trend. Holohan and colleagues also presented a “new” interpretation of the well-known phenomenon of older fathers having long-telomered offspring (=FAB effect, positive association between a father’s age at the birth of his offspring and the offspring’s leukocyte telomere length) (Unryn, Cook, and Riabowol 2005, De Meyer et al. 2007, Kimura et al. 2008). To date, the only accepted explanations for the FAB-effect have been that telomeres increase in length (De Meyer et al. 2007) and sperm cells with longer telomeres are preferentially selected in older men (Kimura et al. 2008). Although, in the pioneering paper of Unryn et al. (Unryn, Cook, and Riabowol 2005), the authors already wisely predicted that “to eliminate the possibility of unforeseen birth cohort effects, telomere length variation through multiple generations will need to be examined.” Ten years later, Holohan and colleagues write, “we initially hypothesized that the FAB effect and the observed increase in sperm TL in older men may have been a marker for such a secular trend in initial telomere length, as both observations could have resulted from a decrease in initial telomere length over time” (Holohan et al. 2015). However, no reference is given (e.g., to Unryn et al. ), and I could not find any other paper by the authors claiming that the father-age-at-birth-effect is actually a consequence of intergenerational telomere shortening. Moreover, I proposed a theoretical model in 2011 entitled ‘Old fathers and long-telomered offspring: elongation of telomeres in the testes of older men versus transgenerational erosion of germline telomeres’. The paper included a figure, which illustrated my claim of stable testis telomeres and intergenerational telomere erosion in the female germline (Figure 1) (Stindl 2011). To highlight how unthinkable the idea of intergenerational telomere erosion in healthy females was during that time: five “western” journals rejected the publication of the theory and I finally submitted it to the University of Tehran, supposedly the axis of evil (G. W. Bush), but surprisingly the last resort of free thought. This Iranian peer-reviewed journal later became part of Elsevier, but articles have not been listed in PubMed Central. Thus, I republished the figure (and an advanced version of my evolutionary theory) in early 2014 in the respectable journal Naturwissenschaften (Stindl 2014) and sent the manuscript and an extra image file of the figure to many of my colleagues in the telomere field (e.g., one of the senior authors of the Holohan et al. paper). Figure 1 is a reproduction from these previous publications (Stindl 2011, 2014) and includes the original figure legend from 2011. It summarizes my predictions based on an analysis of the available telomere data during that time, namely that transgenerational telomere erosion in the female germline causes a birth cohort effect, which has been falsely described as an ageing effect of older fathers, and that telomerase stabilizes (not lengthens) sperm cell telomeres during a male’s lifetime (Figure 1) (Stindl 2011, 2014). This theoretical model seemed to have passed the usual four stages of acceptance (Haldane 1963) within just 4 years: i) this is worthless nonsense, ii) this is an interesting, but perverse point of view, iii) this is true, but quite unimportant, iv) I always said so. One of the reasons why Holohan and colleagues might have decided not to cite an evolutionary theory based on intergenerational telomere erosion could have been that they thought current evolutionary models were sound and did not need a rethink. Yet, the title of the recent Nature paper ‘Does evolutionary theory need a rethink?’ suggests otherwise (Laland et al. 2014). Accordingly, intergenerational telomere erosion in healthy populations (Stindl 2004) could provide the basis for a fundamental rethink and could finally revive the old European mainstream model of saltatory evolution of nonadaptive characters, which might better fit the archaeological and molecular findings (Stindl 2014). To distinguish between a temporary trend caused by environmental pollution (Holohan et al. 2015) and a general evolutionary mechanism of intergenerational telomere erosion (Stindl 2004, 2011, 2014), we urgently need reliable telomere length data from multigenerational studies on mammals with a short generation-time (e.g., short-telomered wild mice under controlled environmental conditions). Because the implications of this alternative evolutionary model are groundbreaking, I am confident that young and open-minded colleagues can be motivated to perform the long-awaited experiments. Proposed model of germline telomere length dynamics in both sexes during reproductive ages and over several human generations. The crossing points of the two solid lines represent the start of the next generation and the fact that germ cells of a newborn contain a mixture of maternal and paternal chromosomes. For simplification of the graph the following assumptions are made: 1) all founder individuals (generation 0, not shown) have equal germ cell telomere lengths at birth 2) all females reproduce at the same age with males of the same generation 3) in females the telomere lengths of ovulating eggs are shown and the starting points of each female generation correspond to puberty (Menarche) 4) the partial telomere recovery during the early embryonic phase is not considered. The average net loss of telomeric DNA per generation is assumed to be 600 bp, based on findings of epidemiological studies where the offspring had 15(–20) more base pairs for each year of increasing paternal age at conception (De Meyer et al. 2007, Kimura et al. 2008); and based on the average human generation time of ~20 years. Theoretically, a telomere reserve of 30.000 bp would guarantee a stable human karyotype for 1000 years, after that a new chromosomal race would prevail (Stindl 2004). The dotted lines represent the effects of (very) old fathers versus old mothers – all members of previous generations – on the germline telomere length in their offspring. The negative impact of the mother's age on telomere length in the offspring is less pronounced because the reproductive time frame is half that of males and older mothers in western societies tend to have husbands of the same age, who neutralize the negative effect on offspring's telomeres. De Meyer, T., E. R. Rietzschel, M. L. De Buyzere, D. De Bacquer, W. Van Criekinge, G. G. De Backer, T. C. Gillebert, P. Van Oostveldt, and S. Bekaert. 2007. "Paternal age at birth is an important determinant of offspring telomere length." Hum Mol Genet no. 16 (24):3097–102. doi: 10.1093/hmg/ddm271. Haldane, J. B. S. 1963. "The truth about death: The Chester Beatty Research Institute serially abridged life tables, England and Wales, 1841-1960." Journal of Genetics no. 58 (3):463-4. Holohan, B., T. De Meyer, K. Batten, M. Mangino, S. C. Hunt, S. Bekaert, M. L. De Buyzere, E. R. Rietzschel, T. D. Spector, W. E. Wright, and J. W. Shay. 2015. "Decreasing initial telomere length in humans intergenerationally understates age-associated telomere shortening." Aging Cell. doi: 10.1111/acel.12347. Kimura, M., L. F. Cherkas, B. S. Kato, S. Demissie, J. B. Hjelmborg, M. Brimacombe, A. Cupples, J. L. Hunkin, J. P. Gardner, X. Lu, X. Cao, M. Sastrasinh, M. A. Province, S. C. Hunt, K. Christensen, D. Levy, T. D. Spector, and A. Aviv. 2008. "Offspring's leukocyte telomere length, paternal age, and telomere elongation in sperm." PLoS Genet no. 4 (2):e37. doi: 10.1371/journal.pgen.0040037. Laland, K., T. Uller, M. Feldman, K. Sterelny, G. B. Muller, A. Moczek, E. Jablonka, and J. Odling-Smee. 2014. "Does evolutionary theory need a rethink? - POINT Yes, urgently." Nature no. 514 (7521):161-164. doi: 10.1038/514161a. Stindl, R. 2004. "Is telomere erosion a mechanism of species extinction?" J Exp Zool B Mol Dev Evol no. 302 (2):111–20. doi: 10.1002/jez.b.20006. Stindl, R. 2014. "The telomeric sync model of speciation: species-wide telomere erosion triggers cycles of transposon-mediated genomic rearrangements, which underlie the saltatory appearance of nonadaptive characters." Naturwissenschaften no. 101 (3):163–186. doi: 10.1007/s00114-014-1152-8. Unryn, B. M., L. S. Cook, and K. T. Riabowol. 2005. "Paternal age is positively linked to telomere length of children." Aging Cell no. 4 (2):97–101. doi: 10.1111/j.1474-9728.2005.00144.x. Submitted to Aging Cell 05/27/2015, rejected without review 06/04/2015.